BUYING FOR A LARGER ORGANISATION? C-Tec are due to launch their new offering into the fire alarm system market place. This system is known as the C-Tec ZFP. 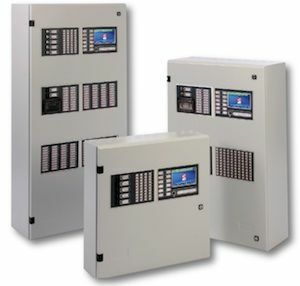 The C-Tec ZFP fire alarm control panels will be available from 2 to 8 loops in size and will be networkable. This system will support the Apollo analogue addressable fire alarm protocol devices. 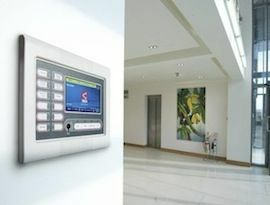 For more information on the C-Tec ZFP Fire Alarm Panels call us NOW on 01200 428 410. This range of control panels is designed to compliment the successful range of C-Tec XFP Fire Alarm Control panels and will allow C-Tec to offer fire detection solutions for much larger buildings without the need to network smaller panels together. The C-Tec ZFP Panel features an attractive touch screen display which allows the user and engineer to control the functions of the fire alarm system once the enable key has been turned. This touch screen is featured on both the main control panel and also the compact controller units which can also be networked to the fire system. These compact controllers are ideal for use in reception areas where they give control functions to the ZFP fire system and also provide full network information. If you’re interested in the C-Tec ZFP Fire Alarm Panels you may also be interested in the C-Tec XFP Fire Alarm Panel and C-Tec EFP Panel ranges. Are you looking for high quality fire alarm systems? At The Safety Centre, we have an exceptional range of the best systems and equipment for a variety of different requirements. Whether you are looking for wireless alarm systems, call systems, a sealed lead acid battery, fire extinguishers or domestic fire detectors, you will find what you are looking for when you browse through our collection. Here at The Safety Centre we are fire safety specialists and believe in providing our customers with the most dependable fire alarms and products in the industry. It is this commitment to first class equipment that has made us one of the leading providers of fire alarms and other safety equipment. We believe that when it comes to alarm systems that you won't find better elsewhere, so you should be sure to browse through our competitively priced collections today. As we are passionate about only providing our customers with the finest fiew alarms on the market, you can trust that you will be purchasing the best and most reliable systems. Due to the efficiency and dependability of our outstanding equipment, it has been incorporated in a range of high profile locations - so you can rest assured that our alarms won't let you down. We offer a broad range of wireless alarms which are becoming increasingly sought-after across the world, and these innovative fire alarm systems are now as effective as wired alarms due to the improvements in radio technology over the past 20 years. Wireless fire alarm systems can be incorporated into both commercial and industrial settings and are extremely easy to install. Our wireless systems are extremely affordable and competitively-priced, and they also incorporate a range of features, such as sounders, call points, beacons, control panels and repeater panels. You should be sure to come to us for the best wireless fire alarms in the industry. If you are looking for a premium sealed lead acid battery then you will be delighted with our range. We offer a sealed lead acid battery from some of the most popular and respected providers in the fire alarm industry, including Yuasa, Powersonic and Enersys. We ensure that all the sealed lead acid battery products we provide have been manufactured to the highest standard using some of the most state-of-the-art manufacturing techniques. Also, if we do not stock the sealed battery that you are looking for, then you should contact us today to see if we can find it for you. Fire extinguishers are a must-have on any commercial or industrial site, so it is important that you purchase effective and reliable extinguishers. At The Safety Centre, we only stock fire extinguishers which have been manufactured to the highest standard, so you can choose from our ranges of Thomas Glover (Chubb Fire) extinguishers. As well as commercial and industrial fire extinguishers, we can also supply you with extinguisher cabinets, fire blankets, home and car fire extinguishers and accessories. So whether you are looking for wireless fire alarm systems, wired fire alarms, a sealed lead acid battery or fire extinguishers, you are sure to find the perfect fire safety product for your needs with us here at The Safety Centre.
" Good package, saved the hassle of selecting all the products individually. Arrived a couple of days after ordering.	" Feel free to fill out our quick contact form if you have any issues. The Safety Centre has an extensive range of fire and safety products that we supply to companies and individuals worldwide, with over 30 years experience you can trust us to deliver a bespoke solution for all your fire and safety requirements.